The Wiltshire and Swindon Police and Crime Panel has published its annual report for 2013. The annual report sets out the panel’s key achievements in its first year and work plan for the next 12 months. 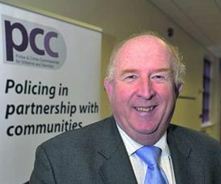 Police and Crime Commissioner (PCC) for Wiltshire and Swindon Angus Macpherson is consulting on the police and crime element of council tax for 2014-15. The Commissioner is considering an increase in the police and crime element of council tax of £3.15 a year for the average home (band D property). This to help reduce the impact of significant central government grant reductions on policing and crime services in Wiltshire and Swindon. The consultation will run from Monday 6 January 2014 – Monday 3 February 2014. During this time the Commissioner and members of his office will be attending Wiltshire Council Area Boards and Swindon Borough Council Locality meetings to talk with people about the proposal. People can also read more about the proposal and give their views on the Commissioner’s website. Three people from Cricklade have recently appeared at Chippeneham Magistrates Court following an incident that occurred on the 30th of June in Cricklade High Street. Appeal for public’s help in finding missing Cricklade man. Wiltshire Police is appealing for the public’s help in locating a missing man. Royston Fletcher, 66, (DOB: 14/05/1947), was last seen at Upper Chelworth Farm, Chelworth Road, Cricklade, on Monday 8th July 2013 at approximately 9am. Mr Fletcher is described as white, with shoulder length white hair, cleanly shaven, approximately 5ft 8ins tall and of a thin build. He normally wears a white or red baseball cap, blue jeans and white trainers. Anyone with information regarding Mr Fletcher’s whereabouts is asked to contact Wiltshire Police immediately on 101 or Crimestoppers on 0800 555 111 where information can be left anonymously. POLICE in Cricklade have received a number of reports of horse riders on the roads who cannot be seen due to the dark colour of their horses and clothing. The police are asking riders to wear a fluorescent tabard. Sergeant Martin Alvis said: “This important piece of clothing could save your life and the life of your horse. Colin Skelton, Independent Police and Crime Commissioner Candidate committed to tackle anti-social behaviour. Colin Skelton, the independent candidate for the role of Police and Crime Commissioner has committed to tackling anti-social behaviour across Wiltshire. In particular, anti-social behaviour associated with our night-time economy and alcohol fuelled violence. Wednesday, 12th October, 2011 7.00 pm at Cricklade Town Hall. Adult Social Care and Day Centre provision to be reviewed and understood better before recommendation. overview Just that, an overview on one page that shows you the local policing unit, along with, phone number, E-mail address and pictures of the officers & PCSOs (if they are available from the force site). A twitter feed from the force, a crime map, details of the next event in the area such as PACT meetings, and links to the main force site, micro-sites, FaceBook etc Crime maps for Cricklade and Purton | Police.uk.